Ask fellow campers about "Renegades On The River" and nearby attractions. Great place right on the St. Johns River. 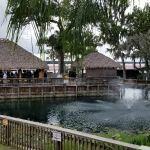 This campground/marina/tiki bar/restaurant are only 4 years old and family run. All the sites are brick pavers and grass between sites. There is very little shade, as the only trees are high queen palms. 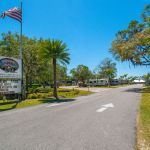 Small campground with some cabins to rent as well and a pool. 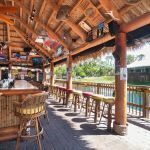 Great if you don't have a car, there is a large restaurant with an outdoor deck and a large Tiki Bar with full bar and entertainment. There is a full marina wit boat rentals and more. Hard to be bored here. Close to Lake George, other than fishing and relaxing, it is a bit removed. Office is located at the rear of the property, hard to find and didn't know if we could drive the rig there, so double parked up front and walked to office. They need to mark better for unfamiliar visitors. We camped at Renegades On The River in a Motorhome. Appealing place. Clean. Easy hookups to use. Pavers at sites with lawn between. Restaurant looks nice, but it's closed mon and tue, so we haven't been able to eat there. Nice bar on the river. Good value at $45. We camped at Renegades On The River in a Motorhome. 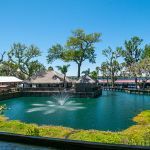 Park has a marina on a beautiful section of the St. Johns River. Marina has a bar / restaurant. Spacious sites, friendly staff. Somewhat remote area, but the park is modern, and well thought out. We plan on returning. 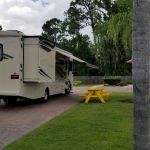 We camped at Renegades On The River in a Fifth Wheel. Are you affiliated with Renegades On The River ?